Touch-book. Sony is affordable. A real SSD, high-end aluminum chassis and touchscreen for 885 Euros (~$1164). 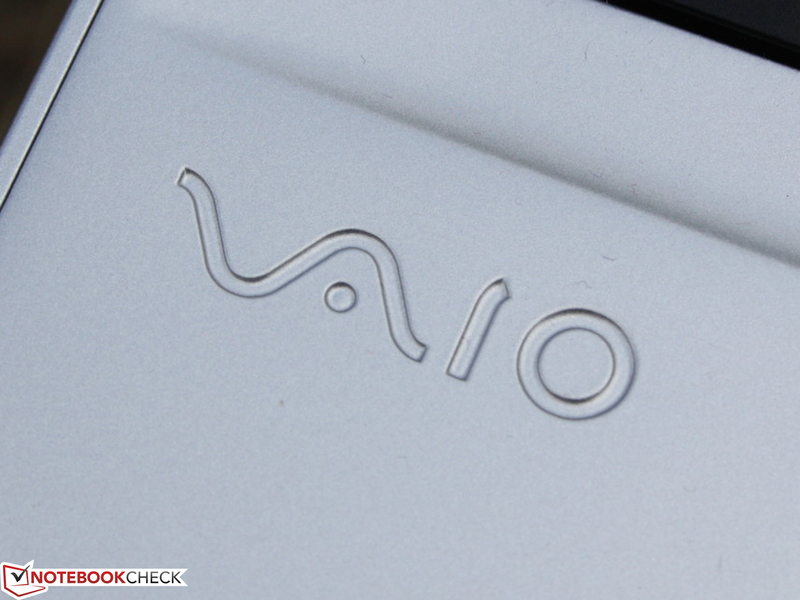 A premium Vaio for little money? 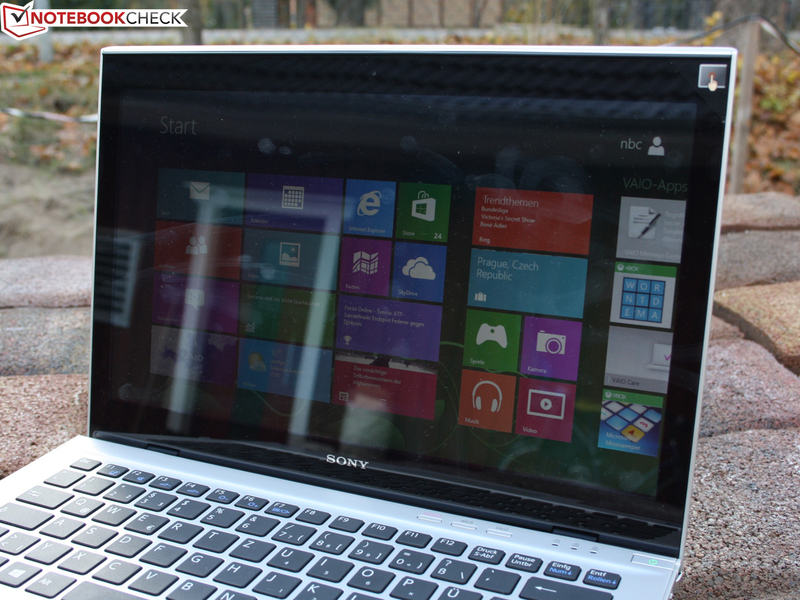 Sony's Vaio SVT-1312V1E/S touch-ultrabook: more power via SSD, Core i5 and Windows 8 finger-style? 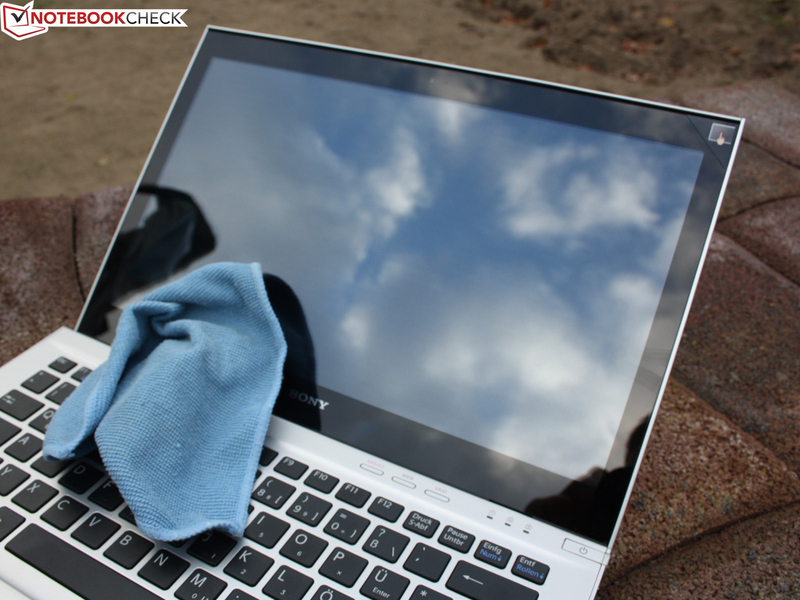 Sony equips its 13-inch ultrabook with an Ivy Bridge generation processor after a slight delay. 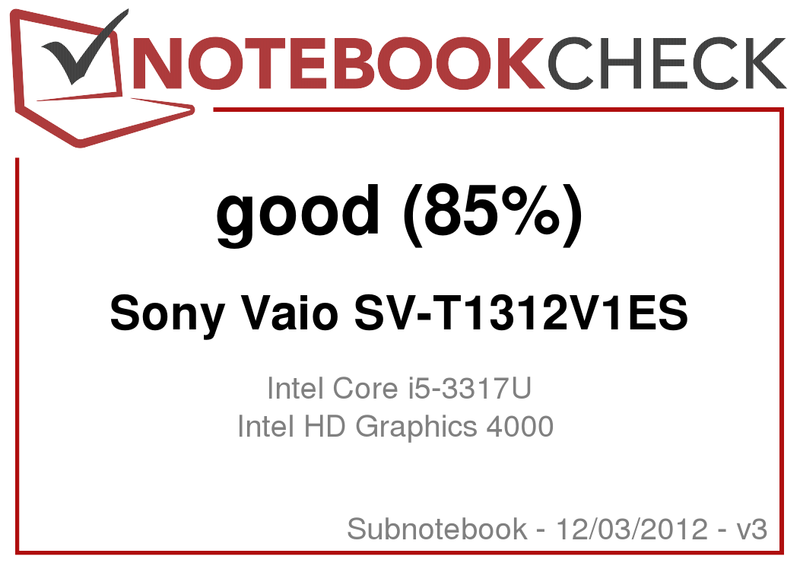 The Vaio SVT-1312V1ES not only complements our first SVT-1311M1ES (i3-2367M) in this regard. It now also includes Windows 8 and the manufacturer was forced to support the operating system's touch affinity by using a corresponding screen. Our test update focuses on the increased performance (i5, 128 GB SSD) and the touch input (modified build). We hope that it is no longer the same contrast and viewing angle poor screen as in the SVT-1311M1ES. 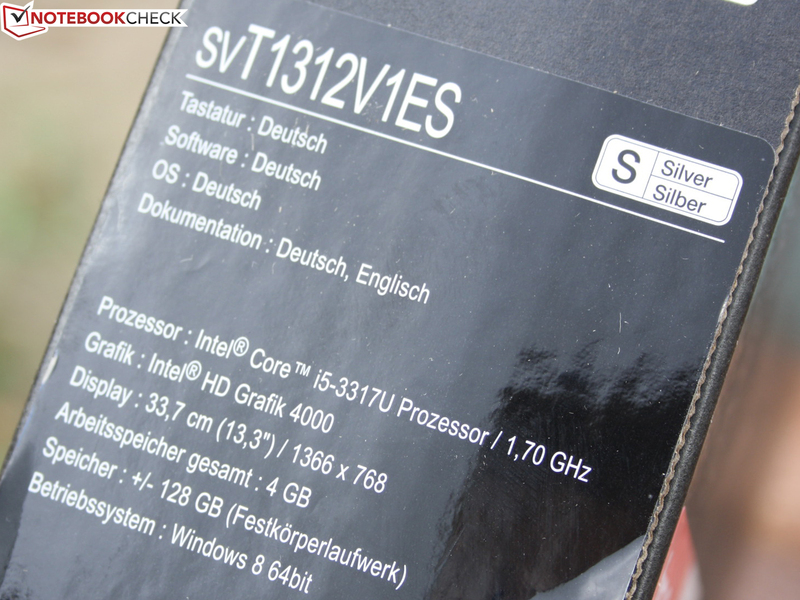 We refer to the in-depth review of the SVT-1311M1ES (June 2012) for all other details, such as build/looks, input devices, connectivity and accessories. The competition follows at the heels. Apart from the convertibles, Asus' VivoBook S400CA and HP's Envy TouchSmart 4-1102sg (review coming soon) offer Windows 8 + touchscreen (both below 1000 Euros, ~$1315). Acer's Aspire S7 391 also belongs to this category, but is much more expensive with its ultra-thin chassis (starting at 1390 Euros, ~$1829). 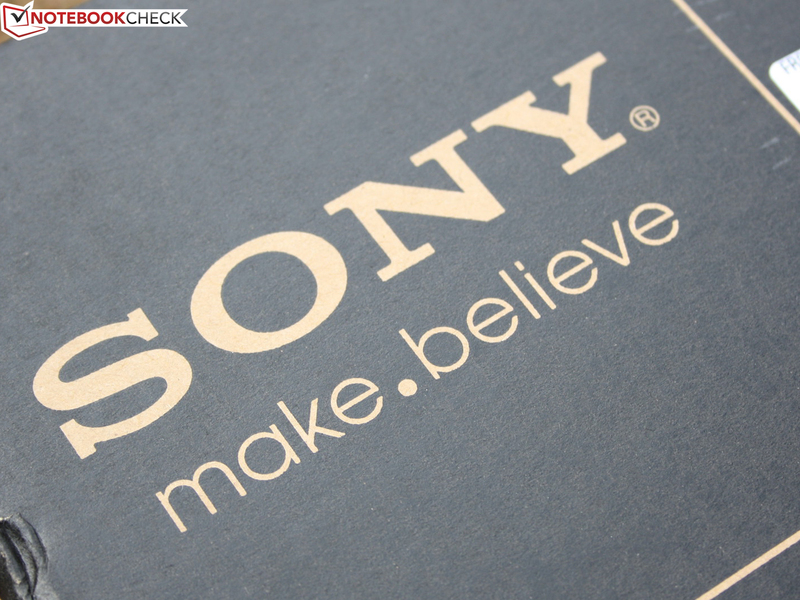 The model name simply goes up a digit and Sony does not alter the casing, which we deemed good in the first review. Matte surfaces, decent stability and a pretty aluminum cover on the lid. The battery is still removable but does not affect the build. More information can be found in the first test report. But there is one important modification related to the new touchscreen. We criticized the pliable, thin lid in the non-touch model. 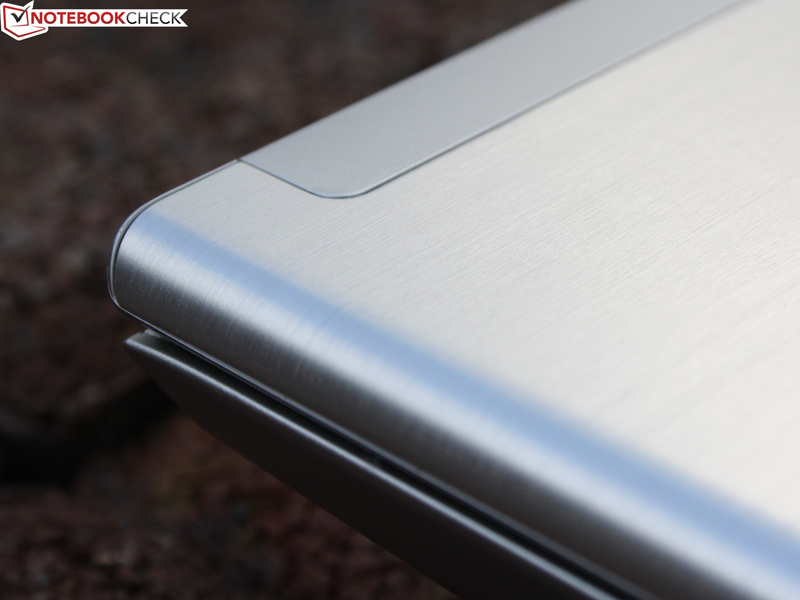 Sony inevitably eliminated this weak point with the touchscreen's edge-to-edge cover. The pane that covers the entire surface is not only adequately pressure resistant (though not as solid as in good tablets); it also reinforces the lid's torsional stiffness. The hinges have a very tight hold on the lid. We need both hands for opening it. 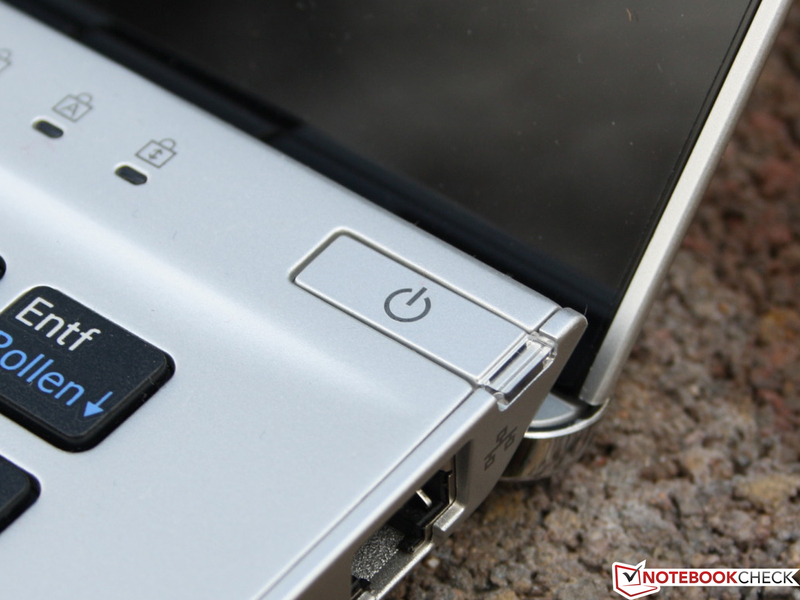 However, the screen stays firmly in place and does not tilt back as easily when touched by the fingers. Its maximum opening angle is 140 degrees anyway. Unfortunately, the lid rocks when touched sporadically which soon becomes annoying when using it with the fingers. The looks of the capacitive 13.3-inch touchscreen (16:9; 1366x768 pixels) has completely changed in comparison to the non-touchscreen. We already mentioned the edge-to-edge construction's stabilizing effect. The screen is still reflective, which does not surprise us as much as in the non-touch model because of its touch quality. The CMN N133BGE-LB1 screen model features a low contrast of 254:1 as well as a low average brightness. The differences to the non-touch SVT-1311M1ES are marginal (contrast) up to equal (brightness). Devices, such as Asus' UX31A with an IPS screen, prove that vivid colors are possible. Low-cost subnotebooks like Asus' VivoBook S400CA rarely sport high-end screens. 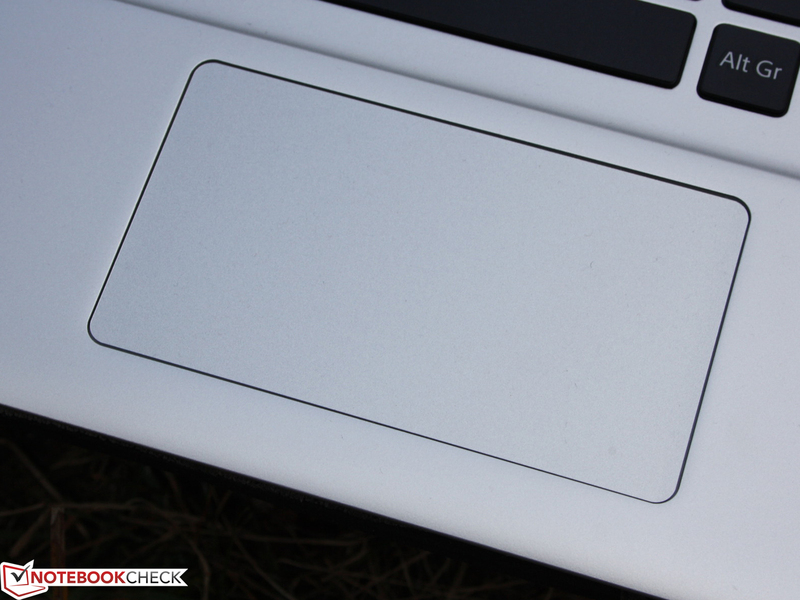 But the VivoBook at least serves with a contrast of 487:1 although the brightness is equally low. More expensive touchscreen convertibles, e.g. Dell's XPS 12, Asus' Taichi 21 or Vaio Duo 11, exhibit very good contrasts owing to their viewing angle stable IPS screens. Knowing this, it is not surprising that the SRGB and AdobeRGB color space are clearly failed. However, color gamut is particularly important for professional image editors who would return the Vaio already just because of its low resolution and low-voltage power. The reflective surface and the low average brightness of 155 cd/m² disqualify the touch-Vaio for use on the terrace or the beach. The glare-type reflects the surroundings so intensely even in overcast conditions that comfortable working is impossible. But it gets even worse: the brightness is dimmed to 130 cd/m² on battery power (center). The non-touch model did not reduce the brightness. The brightness for a glare-type screen would have to at least be 300 cd/m² in order to read from the screen acceptably outdoors. Many tablets achieve this brightness or an even higher luminosity. That at least reduces the mirror effect a bit. Even a 150 Euros (~$197) Prestigio MultiPad 7.0 Prime Duo (PMP5770D) manages 300 cd/m². The viewing angles are, as usual, less than good. The reason is the TN screen model (twisted nematics). 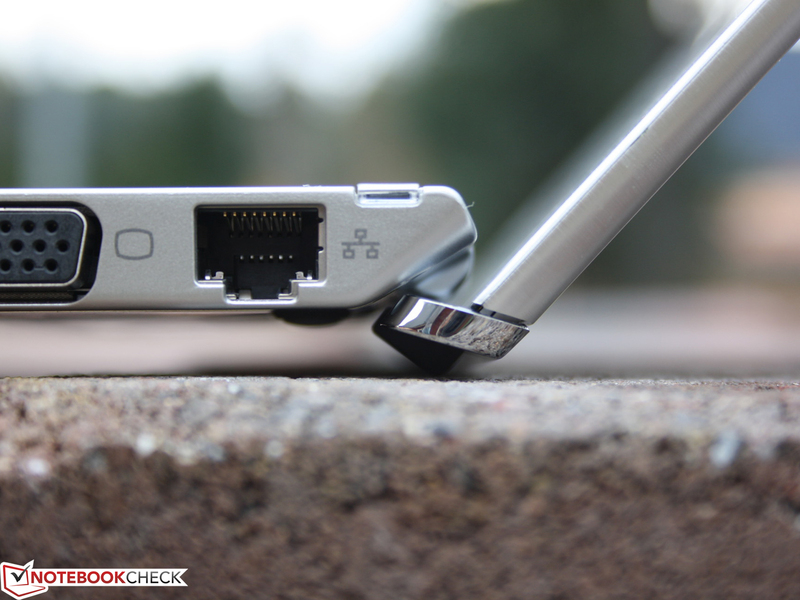 It only allows looking at the Vaio from a maximum angle of 45 degrees horizontally (lateral view, see screenshot). Extreme inverting begins beyond that. The slightest deviations from 10 degrees are enough for ghosting vertically, so when looking up or down. The VivoBook S400 CA is not much better in this regard. Genuine IPS screens are really satisfying in terms of viewing angles. 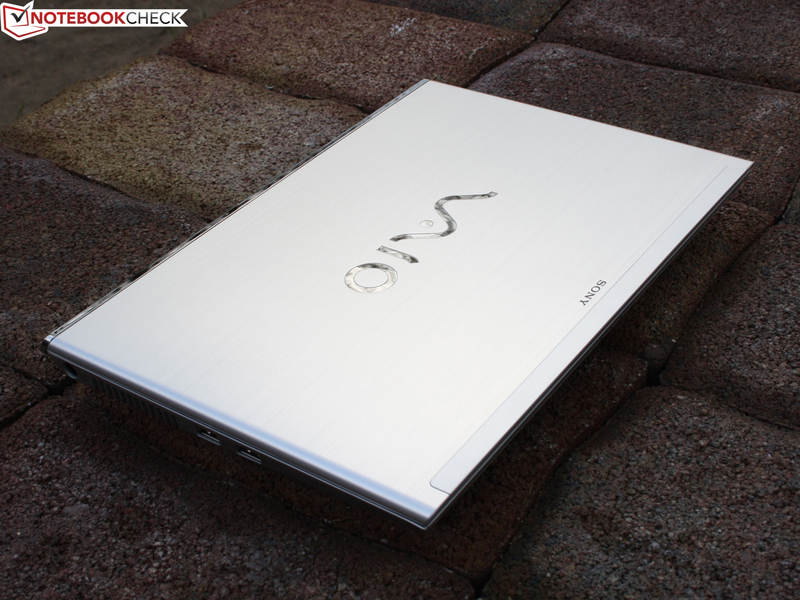 The Vaio SVT-1312V1E/S sports Intel's Core i5-3317U (2x 1.7 GHz). It is the most frequently used midrange ultrabook processor. In view of the prior test, the i5 practically replaces the Core i3-2367M (Sandy Bridge). The i5 CPU can increase its clock to 2.6 GHz via Turbo Boost 2.0, which should include a significant increase in processing power in contrast to the i3. However, an adequately sized cooling system that can quickly discharge waste heat even during load is always essential. Sony also has the i3-3217U (1.8 GHz, no Turbo) and i7-3517U (1.9 GHz, Turbo) in its range. Sony relies on either a 500 GB HDD + 32 GB SSD (cache) or an SSD with 128 / 256 / 512 GB capacity storage device. A steep surcharge of 1150 Euros (~$1513) is demanded for the latter. We are testing a reasonably priced model for 885 Euros (~$1164). It features the 128 GB SSD from ADATA (AXM14S3-128GM-B). The storage is inserted as an mSATA module and the 2.5-inch SATA slot is empty. 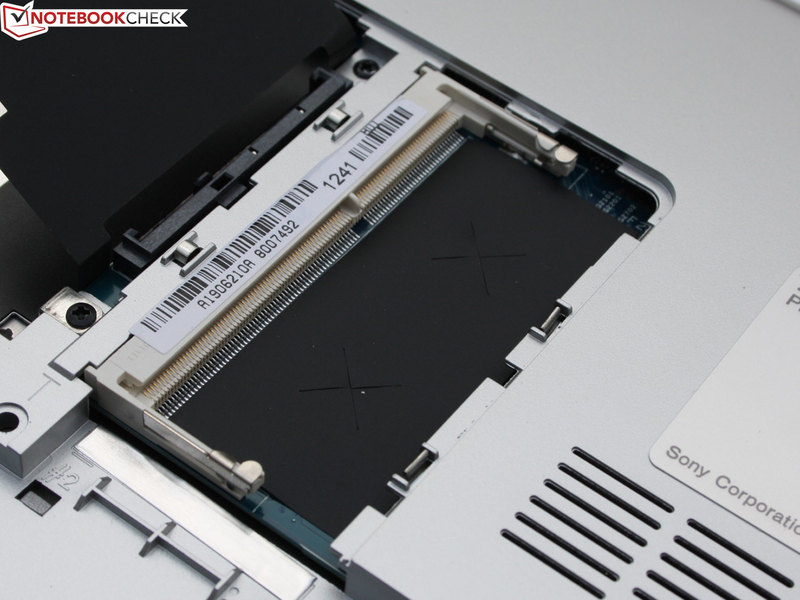 Update 12/3/2012: according to Sony, a second SSD or HDD cannot be inserted in the empty slot - although the SATA connector is installed. Are there any readers who tried this anyway? Using the Cinebench R11.5 tests, we checked whether the i5's Turbo works properly and compared the processing performance with the i3 and i7 option as well as with the Sandy Bridge precursor. This also included the integrated Intel HD Graphics 4000 (OpenGL tests). The i7-3517U only exhibited an advantage of 11 to 18%, which is not really worth the additional 80 Euros (~$105). 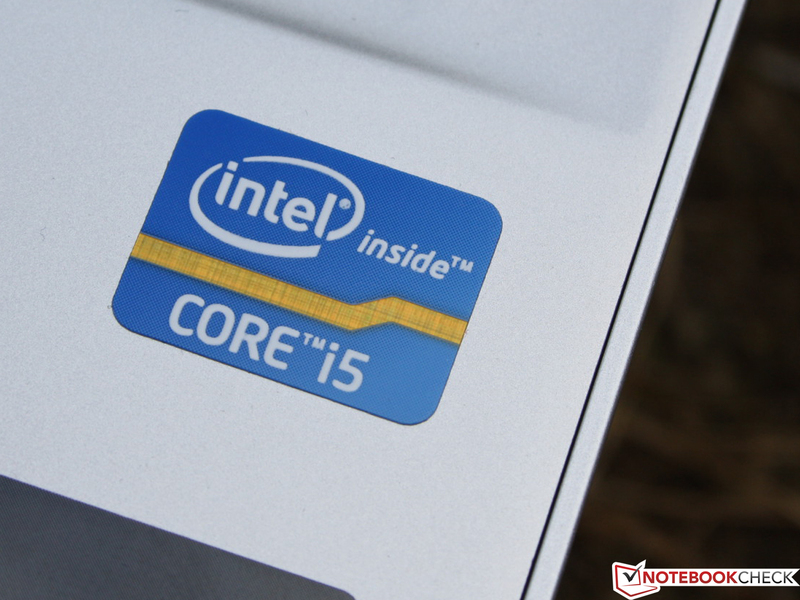 Other i5-3317U devices, such as the ZenBook UX31A, VivoBook S400CA or Aspire S3, are on a par with the test model. The prior Vaio T1311 (2367M, -43%) and the Medion S4216 (3217U, -26%, Vaio i3 alternative) lag far behind. The Sandy Bridge i3 model is particularly far behind in the OpenGL graphics test (-40%). The reason for this is its much slower HD 3000. Because of that, i7 devices with the higher clock of their HD 4000 look good in the OpenGL test (1150 MHz). We looked at the clock rate during the Cinebench R11.5 multi/single tests to check the Turbo. 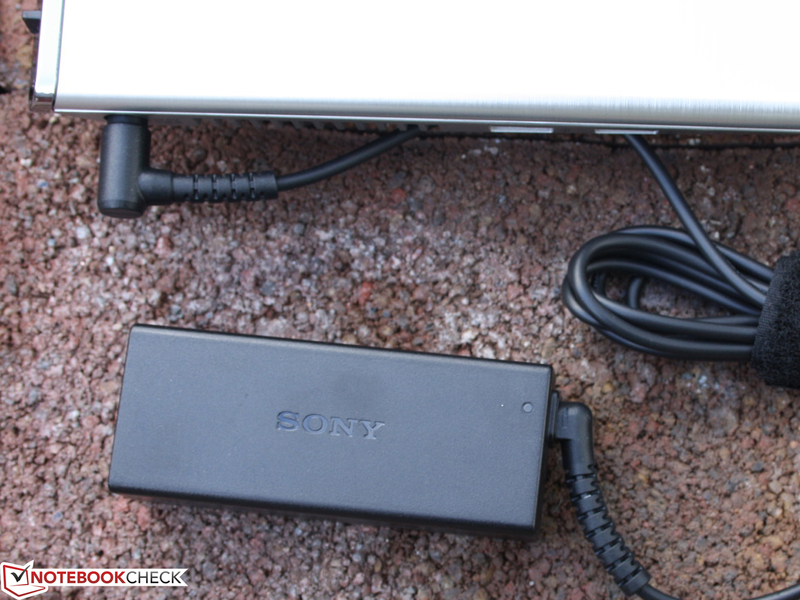 The Vaio can maintain the 2.4 GHz, which is clearly within the Turbo range, in every situation. Thus, the cooling in the small chassis manages to cool the processor sufficiently. The application performance ascertained using PCMark 7 (2011) is good. 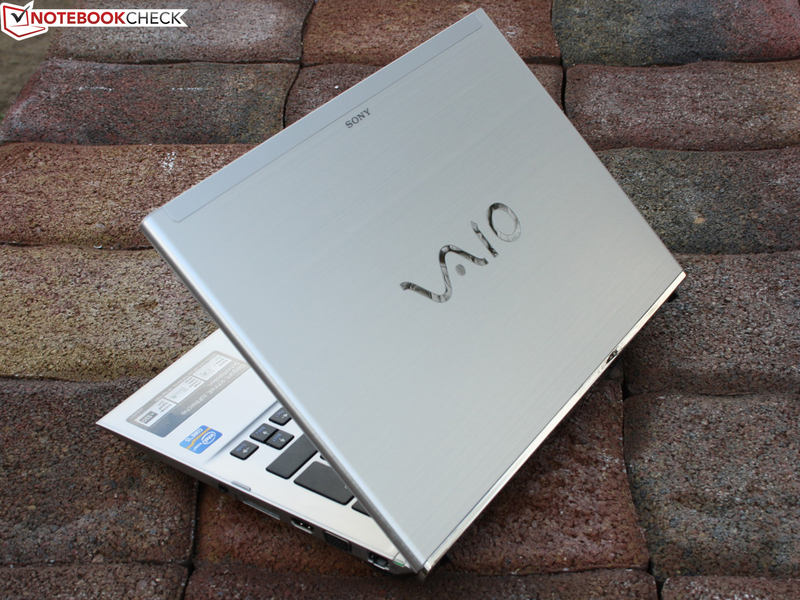 The Vaio ultrabook easily reaches high-end systems equipped with an SSD. However, only the UX31A (i5 but faster SSD) or the Aspire S7 (RAID 0 SSD, i7) can extract the last morsel of performance. 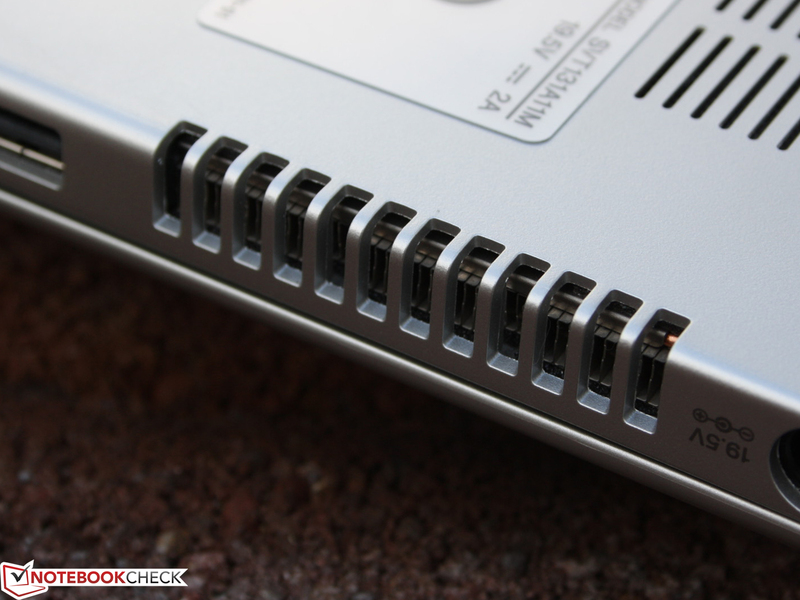 In contrast to ultrabooks featuring a HDD and SSD cache, the Vaio can clearly hold its ground with its mSATA SSD. This was also true for its T1311MES precursor with a 320 GB + 32 GB SSD cache. How does the ADATA SSD (AXM14S3-128GM-B) fare in detail? CrystalDiskMark 3.0 and AS SSD recorded awesome rates of 442 and 477 MB/s respectively in sequential read. HDTune exhibited a somewhat lower rate, which is due to a different test routine. The read speed is only 8% below that of a Lite-On LMT-256M3M in Samsung's 900X3C (CrystalDiskMark). It is also great that reading and writing of small, scattered files is performed quickly (Read 4K). 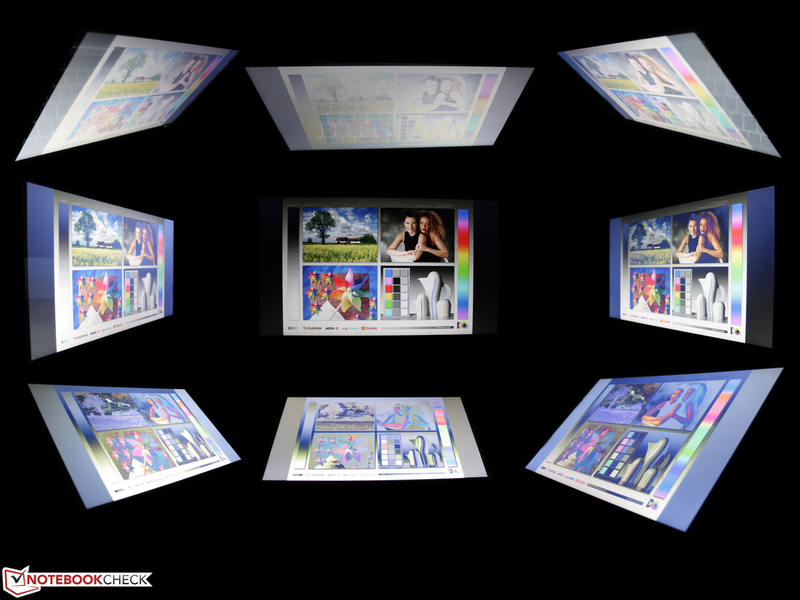 This is exactly what the above mentioned System Storage of PCMark 7 acknowledges. 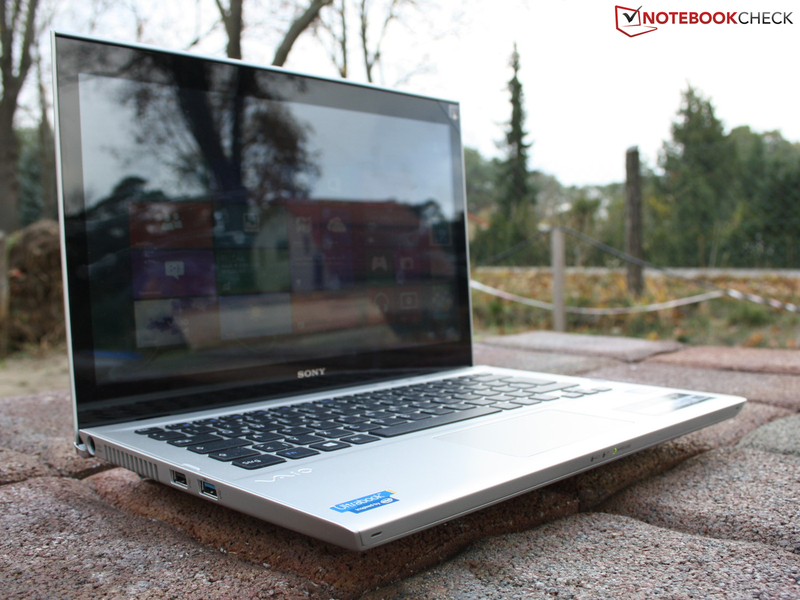 However, faster rates are possible as the ADATA XM11 in the ZenBook UX31A proves. This comparison could be continued even further. But it already becomes clear in this short overview that the Vaio ultrabook revs up with the SSD and that cheaper HDD+ cache alternatives cannot compete with it any longer. The processor-integrated HD 4000 also features a Turbo mode (350 - 1050 MHz). The clock remains stable at 350 MHz on battery power, providing that it is fixed in Intel's settings (energy-saving). Full GPU power is available in performance mode. This is also true for the processor on battery power. The clock remained stable at 1050 MHz in Furmark's GPU stress test. The poor performance in the 3D benchmarks is therefore surprising. The 3DMark 2006 is fairly low for an HD 4000 integrated in a 3317U processor. 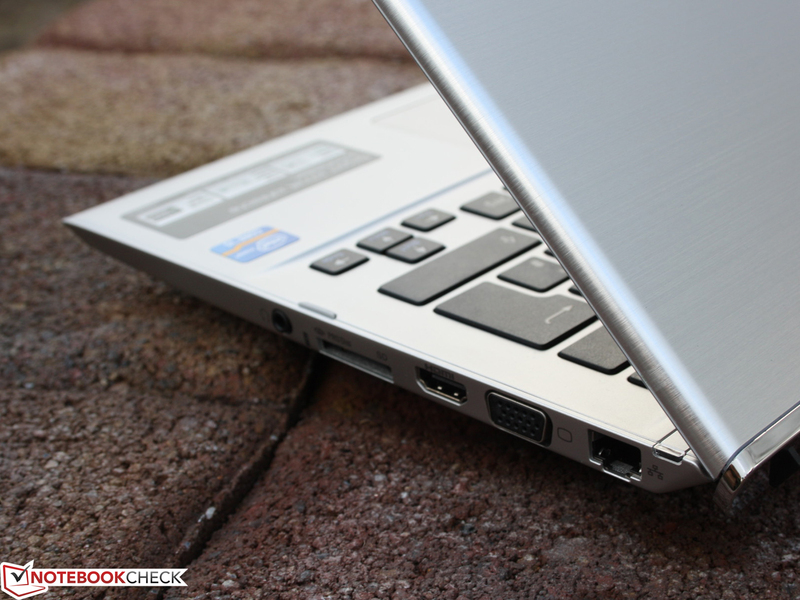 The majority of such equipped ultrabooks are faster by a good 20% with approximately 4500 points. A reason could be the RAM's single-channel memory bus (one module, soldered). The HD Graphics 3000 in the older Core i3 model was only 17% slower. The integrated graphics is rarely suitable for games, and at best only undemanding games, such as FIFA 13, run smoothly. Up-to-date games give up in minimum details. One reason for this is the HD 4000's below-average performance (single-channel). However, 2012 game hits would not be smoothly playable in low details even when the HD 4000 is at its peak performance (Samsung 900X3C, i7). The fan is never inactive in idle. Nevertheless, it is not distracting in quiet surroundings because the lowest level of 31 dB(A) is barely audible. 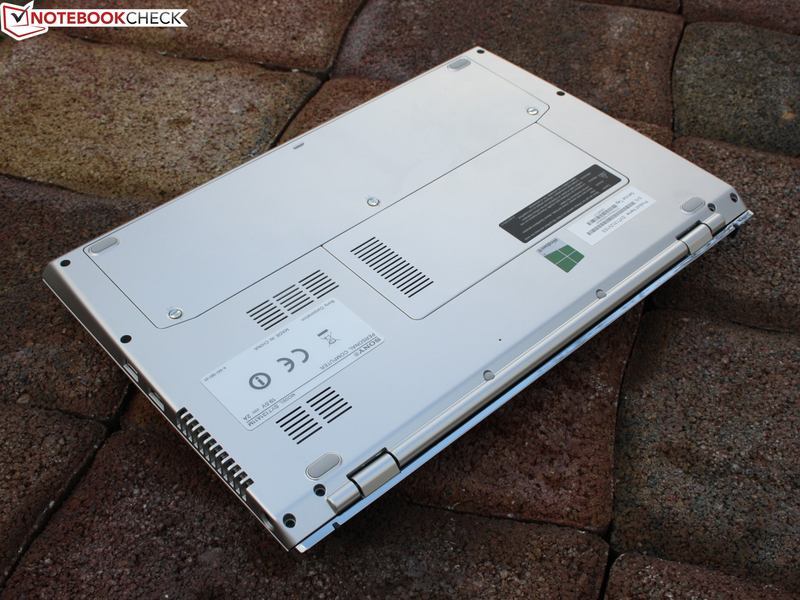 Since there is no spinning hard drive, the 13.3-incher is consequently extremely quiet. But that only applies to long idle periods. The fan's noise increases gently to 34 dB(A) as soon as idle, e.g. conventional office use, is interrupted by opening programs or loading files. Medium load, as induced using 3DMark 06, pushes the fan to high speed: 38.5 dB(A). The stress test comprised of Prime95 (CPU, multi-core test) and Furmark did not increase this level. 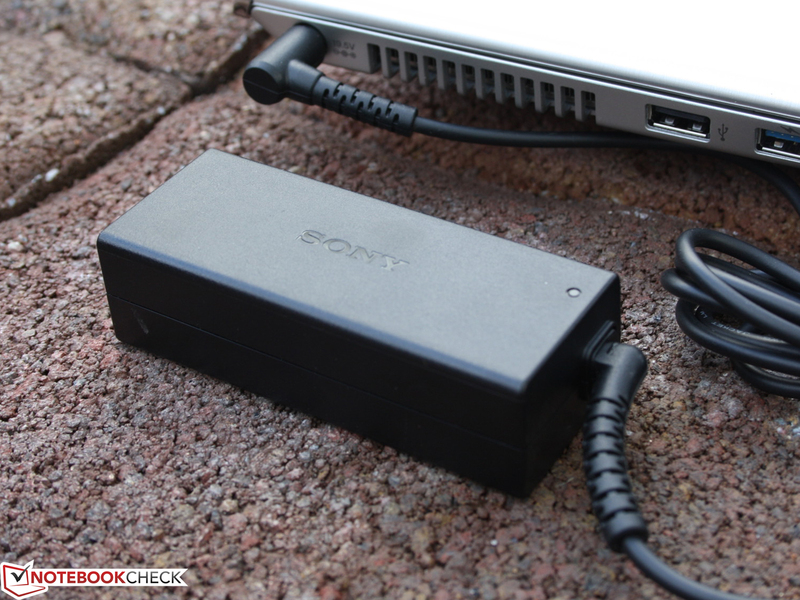 Such a low maximum noise is remarkable for a small device like the Vaio T13. Stress test Furmark & Prime95: 2.1 GHz, Turbo active! The 13-inch Vaio almost stayed so cool in idle as if it were not even on. The T13 also remained cool while surfing on the Web and performing undemanding tasks. The base unit's temperature increased selectively during the two hour stress test (Prime95, multi-core). However, the average temperature increased from 25 to only 33 °C on the top. Even the maximum, selectively generated higher waste heat of 42 °C is no problem. 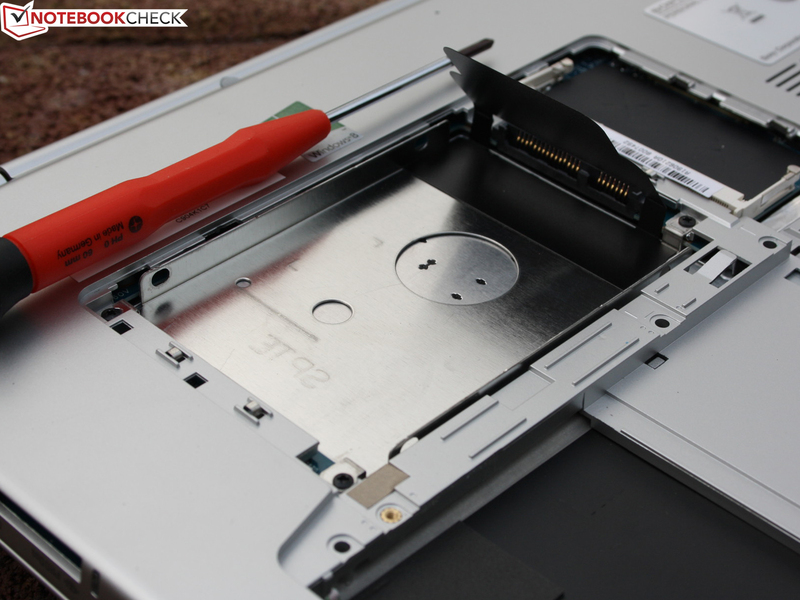 It is positive that the Vaio does not show signs of CPU throttling during use. The Turbo stayed permanently active with 2.1 GHz even in the acid test comprised of Prime95 and Furmark (CPU + GPU load). This is not a matter of course. The recently tested Core i3 system in Asus' VivoBook S200E throttled to 800 MHz within the shortest time in this scenario. The same was seen in Acer's Aspire S3-391 (3317U). The 13.3-incher was one of the most affected candidates. Depending on the intensity, the computing performance of such devices suffers more or less noticeably. Where are the speakers? The bewilderment is great because apart from two small holes on the narrow front, there are no other signs of speakers. However, the two small speakers are exactly behind these holes. The volume is unusually loud but does not distort even in maximum volume. As usual, they do not render a balanced sound. They overemphasize the mids whereby low ranges and differentiated trebles are immensely neglected. However, neither the volume nor the sound is affected when the hands cover the small openings. Thus, the sound remains stable regardless whether the 13-incher is placed on a table or is carried around. 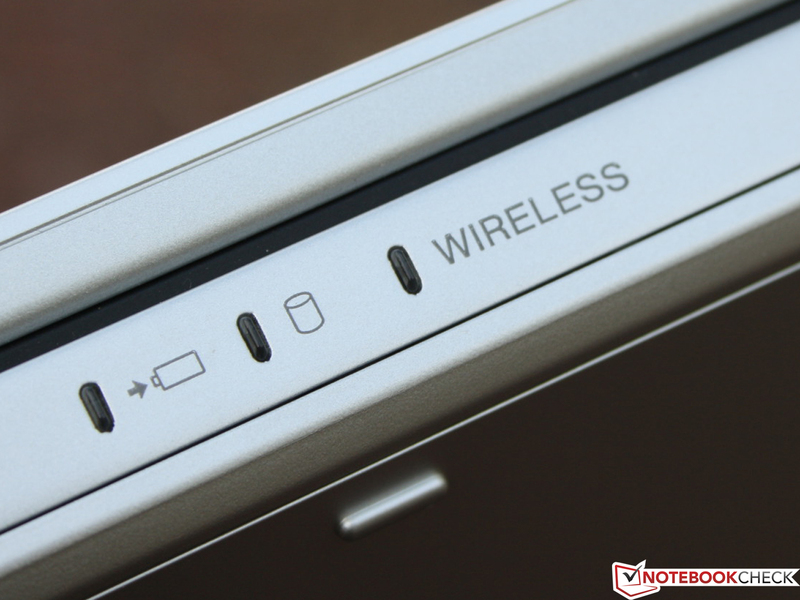 The power consumption from the outlet (battery 100% charged) exhibits a reasonable ultrabook. We only recorded 5 to 10 watts in idle (minimum - maximum). This is due to the energy-efficient Ivy Bridge system (22 nm build), the SSD configuration as well as the not particularly bright screen. 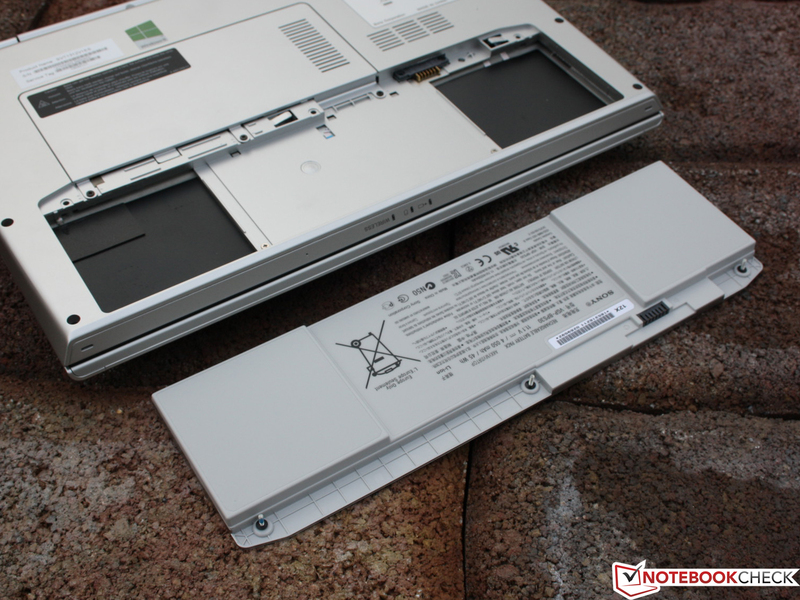 The first 13-inch Vaio SVT-1311 was also satisfied with 6 - 9 watts (i3, 32 nm). A look at the load power consumption is also interesting because the former Core i3 did not feature Turbo Boost. The standard stress test consumed 34 watts. The i3 device needed 32 watts. The 27 watts in medium load are identical (3DMark 06). Are the runtimes higher although the power consumption has increased? 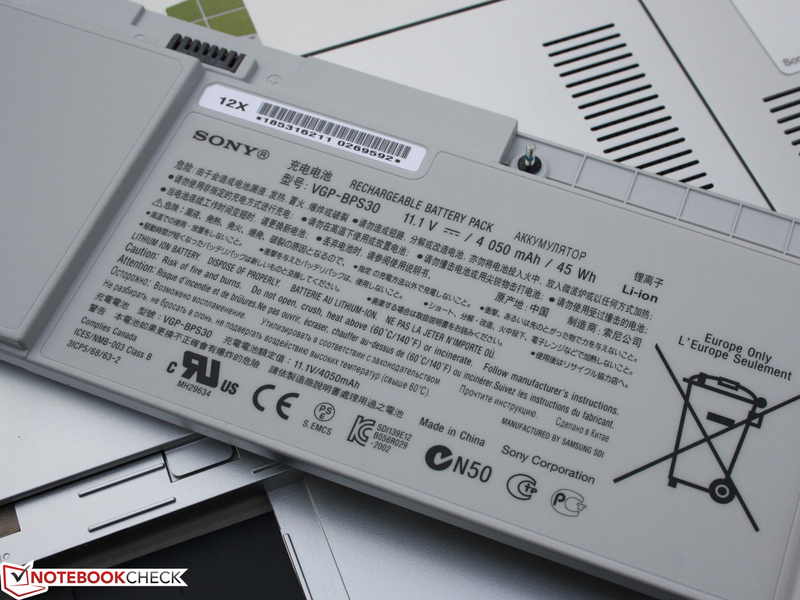 The same 45 Wh lithium polymer battery is still used. Nine hours sound like an awe-inspiring runtime. However, the 557 minutes are unrealistic since they are only reached in idle when using minimum brightness and disabled Wi-Fi modules. The Wi-Fi test, which ran for 5:50 hours, is more significant. That is still 41 minutes more Wi-Fi and 34 minutes more idle runtime than with the prior T1311M1ES Sandy Bridge model. The 13-incher can contend with the competition. The Vaio takes a top position in the Wi-Fi test: Asus' VivoBook S200E: 3:43 h, Asus' ZenBook Prime UX31A: 4:42 h, HP's Envy 4-1000sg: 4:20 h, Acer's Aspire S7 391: 3:29 h and Lenovo's IdeaPad S300: 1:55 h (only 32 Wh). 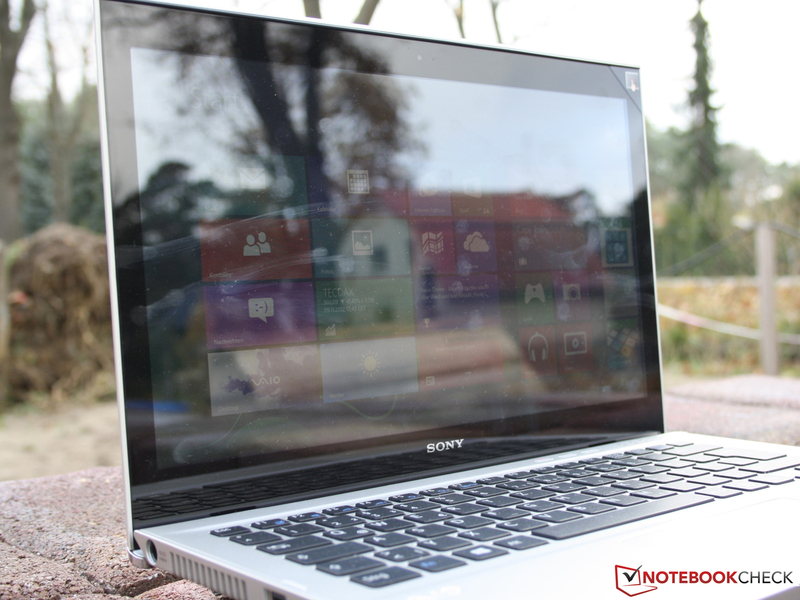 Sony launches the Windows 8 touch ultrabook presented at the IFA 2012 on the market. But not only was the touchscreen, which has a positive effect on the lid's stability, added to the standard version. All ultrabook models from the manufacturer (Core i3 also) are now based on Intel's Ivy Bridge processor generation. However, it is not the Core i5-3317U that provides a performance boost. It is the ADATA 128 GB SSD (AXM14S3-128GM-B), which is inserted in the form of an mSATA module in the device. Apparently there is an empty 2.5-inch SATA slot for upgrade-fans. But it is technically inactive. The high-end workmanship and the firm-to-use input devices belong to the superior ones of their kind, although they are not perfect from a business point of view (short key drop). The low temperature and noise development is a real asset in view of the long battery life of nearly six hours in the practical Wi-Fi test. The processor's consistently high performance that always runs with Turbo speed on both battery power and during the stress test is remarkable. That is not a matter of course among thin ultrabooks. The biggest drawback of the otherwise well-setup touch ultrabook is the screen that is weak in all areas (contrast, viewing angles, brightness). 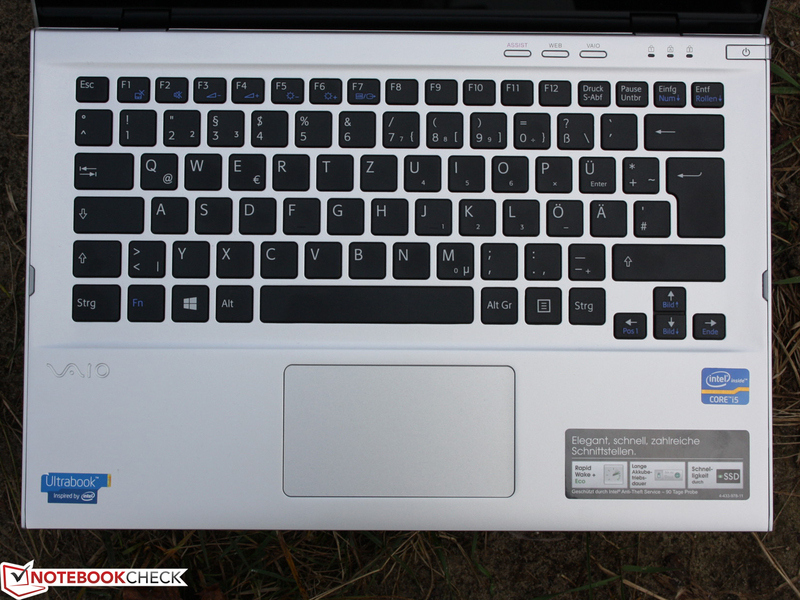 The less expensive Asus VivoBook S400CA (14-inches) at least features a higher contrast although the brightness is equally low. 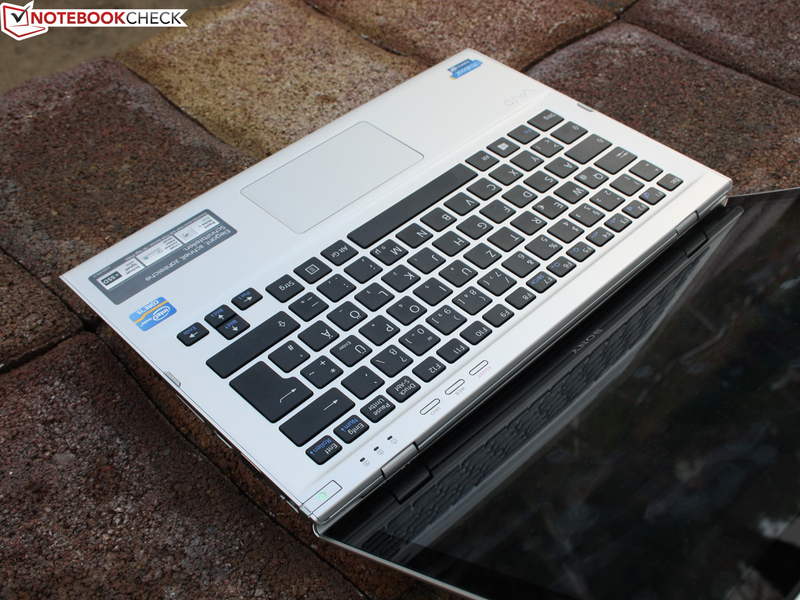 HP's Envy TouchSmart 4-1102sg will be reviewed soon, just like Samsung's 540U3C. 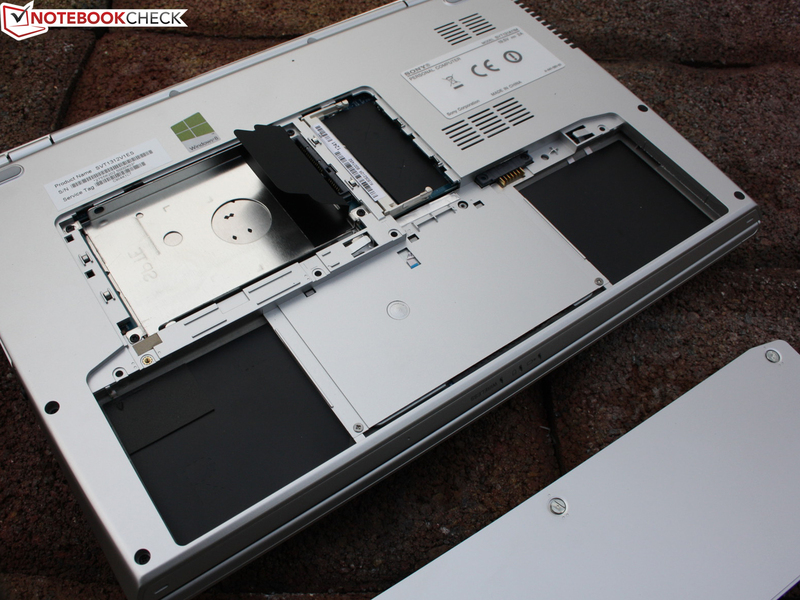 Much superior screens are found in Acer's Aspire S7 391 or in Asus' Taichi 21. However, these devices are considerably more expensive. Buyers who put value on a good touchscreen in a subnotebook should wait for the test reports of the Envy TouchSmart, Samsung 540U3C, Aspire V5-471P, Aspire M5-481PTG, VivoBook U38N and Toshiba's Satellite P8455-107. The 13- and 14-inch devices are all roughly within the same price range. 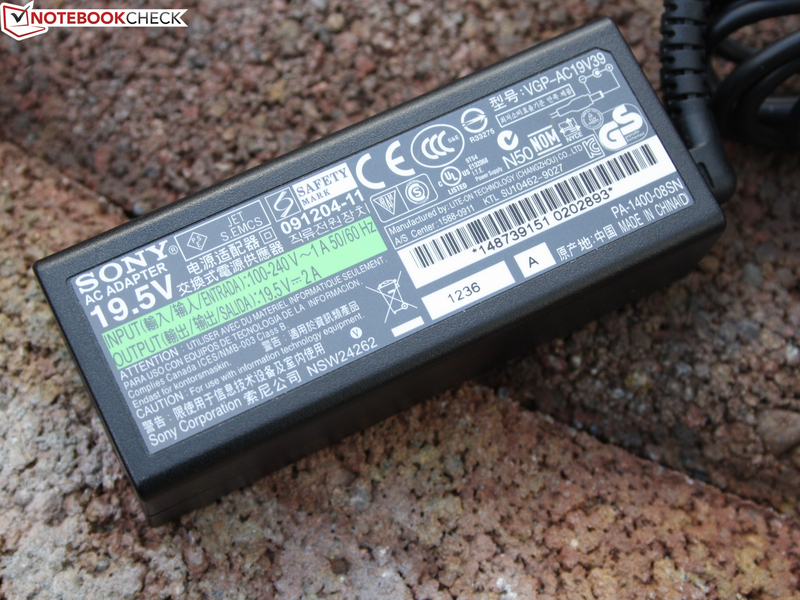 Sony Vaio SVT-1312V1E/S: successful touch and performance update. The weak screen has been maintained. The lid's polished aluminum makes a very elegant impression. The handy 40 watt PSU is easily sufficient for the maximum power consumption of 34 watts. It even allowed recharging the battery in the stress test. Data carriers are not included in the accessories. There is only a quick start guide. 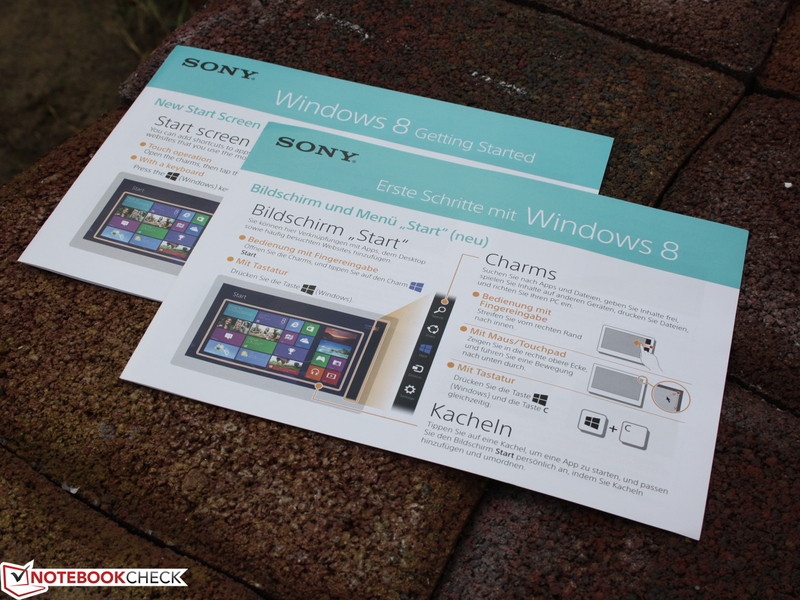 So that nothing goes wrong with Windows 8, the basics are explained in these pages. not only the battery can be removed. Inserting a 2.5-inch HDD/SSD would be possible physically but not technically (according to Sony). 4 GB of RAM are tightly soldered. The empty slot can be furnished with a 2 / 4 / 8 GB stick. Sony bundles hardware settings in the Vaio Control Center. Battery care is set here. 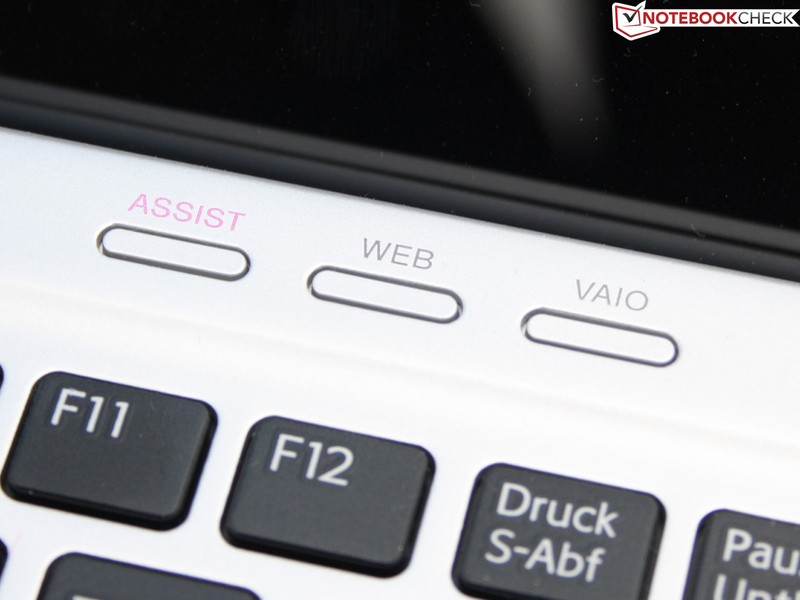 The 13-incher's hardware button (Assist, Web, Vaio) can be mapped with preferred programs. 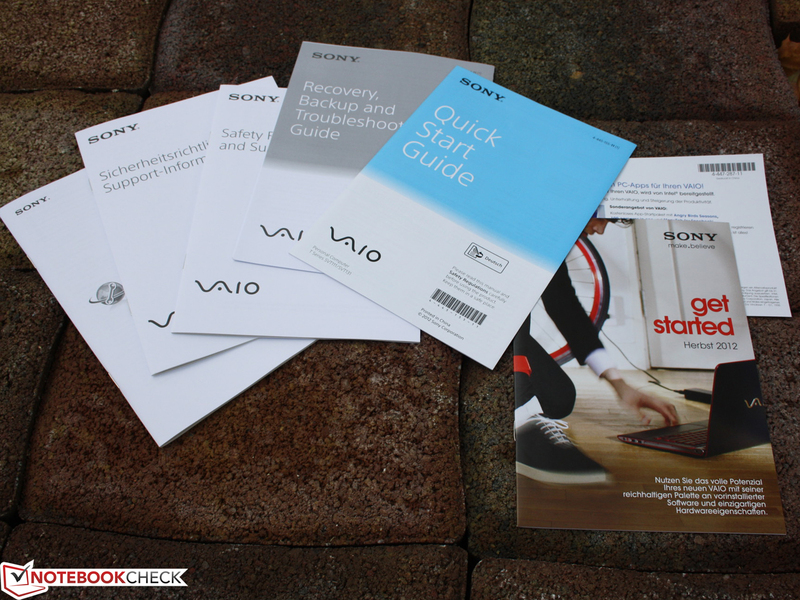 The user can select between maintenance, security, contact to Sony's Service and the mentioned Control Center in Vaio Care. Windows utilities are listed in one Vaio window (defrag, etc.). The status LEDs are on the front, which is sometimes hard to see. lights up prettily in the dark and slowly blinks in standby. but the competition was faster and added the Ivy Bridge successor to their range in the summer of 2012.
an SSD now also dwells in Sony's ultrabook (depending on model). A highlight for the new Windows 8: a touchscreen. 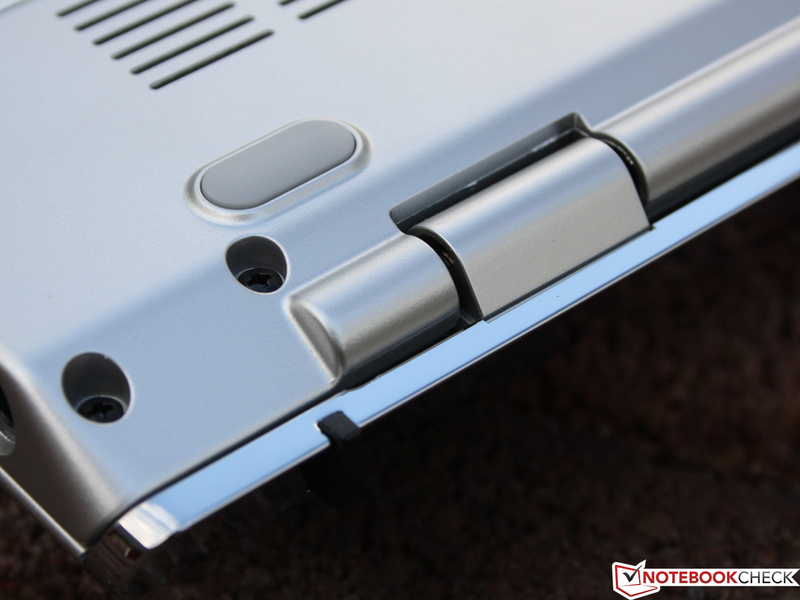 The casing remains unchanged and the aluminum-magnesium alloy that we deemed good in the first review is used. The base unit features a good stability although the battery is removable. now receives a good stiffness due to the edge-to-edge design of the multi-touchscreen. 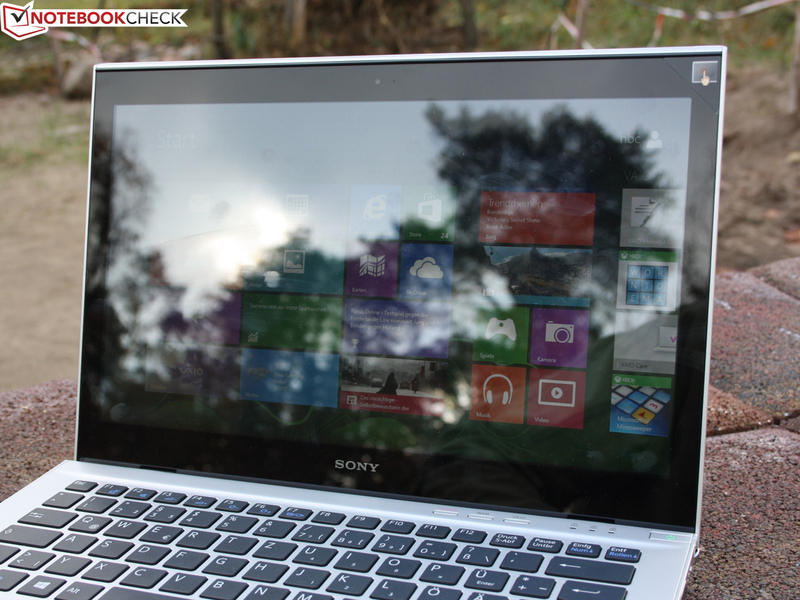 The advantages of the Vaio ultrabook are not only found in computing power. but we could use them swiftly and they feature an agreeable feedback. but like the firm stroke in return. For example, Windows update and the Firewall are found here. No throttling - neither for the CPU nor the GPU. Full performance on battery power. The battery can even be replaced by inexperienced users. Its screw fittings are so rigid that the base unit's stability is not affected. A screen featuring higher viewing angle stability and more contrast, like in Asus' Taichi 21, Aspire S7 or Asus' ZenBook Prime UX31A. 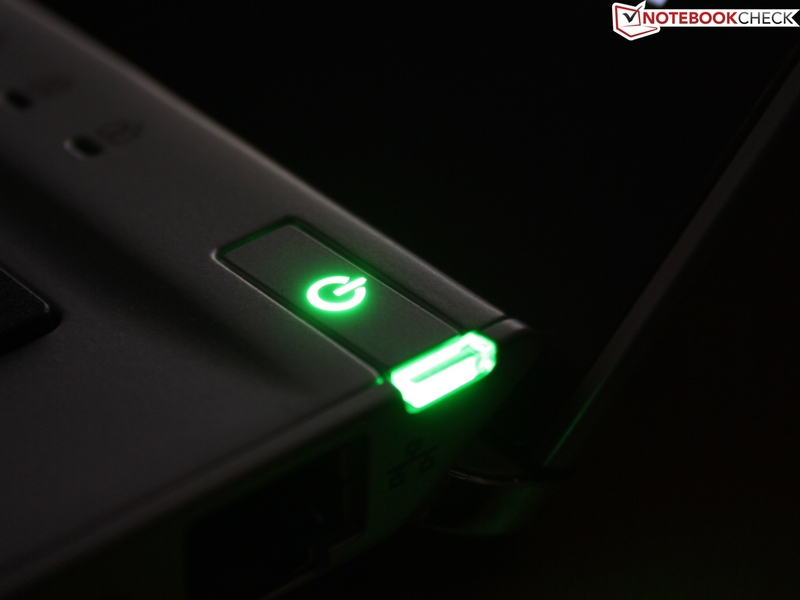 The empty 2.5-inch SATA slot lets the hearts of hardware tuners beat faster. The RAM is not soldered and there are two real SODIMM slots. The 13-incher runs for nearly six hours despite the "small" 45 watt hour battery. Kudos.